Cytech Europe’s COMFORT INTELLIGENT HOME SYSTEM combines an integrated intruder Alarm with home automation controlling lighting, heating, curtains, blinds appliances, home entertainment all working together intelligently. Comfort provides security, convenience and energy-saving. 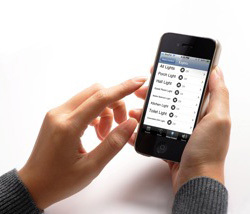 Control it from an iPhone, iPad, a hand-held keypad at home, a mobile, wall-mounted touchscreen, by computer or automatically via set time programmes.